Although she never expressed it quite the same way, I think my mother might have had the same irrational fear as Russ. No, not the one about scurvy. The one about being buried alive. Because she was always a big proponent of cremation. I just never thought I'd see that day so soon. Two weeks before Mother's Day and just about a month before her birthday, I attended my mother's memorial service. So that's why I've been MIA for the past few weeks—a difficult few weeks for my family and me. Hopefully Russ has kept you informed and entertained in the meantime. At any rate, Mom's moved on to a better place, and the rest of us have to lumber on through this earthly life for a bit. Thank God for the good things, like TJ's food (most of it, anyway). And a special shout out to a couple people that were not only friends to my mom, but have also been fans and boosters of this blog—big thanks to Mrs. Erwin and Mariann M. (Bring a Trader Joe's to Chambersburg, Big Joe!) Just as all things must come to an end, my little break has reached its terminus. It's time to rejoin Russ and get back to reviewing the heck out of TJ's treats. Today, we're looking at Trader Joe's Peanut Butter and Jelly with Nonfat Greek Yogurt. This sure ain't my mama's PB&J. It's slightly lower in carbs, for one thing (duh, there's no bread). And it's also not very sweet. Sonia claims she didn't taste any jelly. I thought I tasted something strawberry-ish and fruity, but it just wasn't particularly sweet—like not nearly as fructosey as fruit normally tastes when swirled into Greek yogurt. Usually the tartness of the yogurt sets off the fruit flavor and makes it seem extra noticeable, but not here. 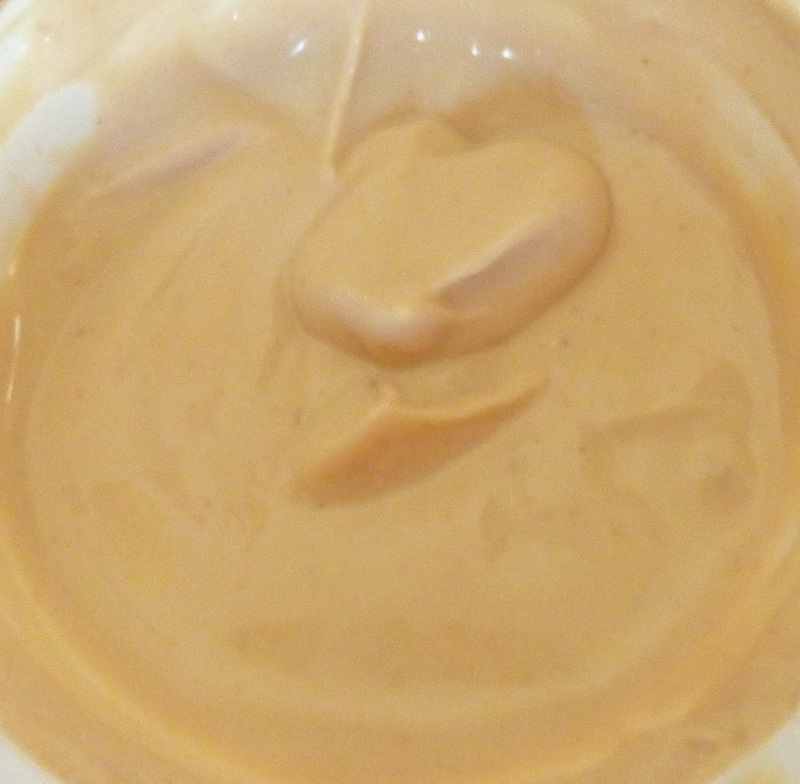 Peanut butter is definitely present, but it still doesn't overpower the Greek yogurt. I think the tart/sour Greek yogurt taste is the dominant flavor in this product. I'll be honest, I was hoping for something a little more dessert-like—a tad more treat-esque, if you will. But then, I'm always looking to quell my sweet tooth. It's insatiable. Texture-wise, Sonia thought it was pretty run-of-the-mill for non-fat Greek yogurt. I felt it was particularly soupy. I stirred and stirred and still had pools of peanut butter-flavored milk with large globs of Greek yogurt floating through it. All in all, this was a slight disappointment to Sonia and I, despite all the Instagram hype to the contrary. What do you guys think? We give this product 3 stars a piece. First of all, my condolences ( and I am sure u will hear it countless times)... I know exactly what u are going thru- I've got a laundry list of those I have lost... I wondered where u were, but figured it was just my hectic crazy life causing a memory slip... that being said,, I hate to say I am afraid to even try something that has peanut butter w/ greek yogurt...somehow it just seems totally wrong... tho, I've been wrong before... anyway glad u are back.. I'm very sorry about your mother's passing. I respect you during your difficult time. Welcome back. I was thinking of having a jelly element actually on the top of the yogurt or the bottom. My condolences, that's not easy to manage. Thanks for the condolences, and yes, "wanted to love it and yet did not" about sums it up! Man. :-( Strange how you can only know of someone via the internet but truly feel for them when they share a loss like this. Your mom raised a really cool person. Sorry to hear this. Thank you for the kind words, tiga. Something about the kindness of strangers, right? My deepest condolences across cyberspace on the loss of your mother. But guess what— your mother will always be with you, as she should. It's been almost 20 years, but I still think of calling my mother when something happens. Although my condolences are belated by 10 months, I do want to send you my regards. I'm sorry to hear about your mother. Warmest wishes to you and your family. 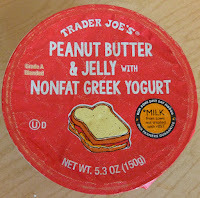 I was super excited when I spotted the PB&J greek yogurt at TJ's a few months ago, and I bought it with high hopes. But when I tasted it, my reaction was "bleghhk!" It was so gross, I couldn't even finish the rest of it after a few bites. I give this yogurt a 1/5. I was expecting something like fruit-on-the-bottom yogurt, especially since the item is called "PB&J WITH greek yogurt," not "PB&J-flavored yogurt." =( There are very few things that I don't like the taste of: sweet pickles, raisins, and sea cucumber. I guess PB&J yogurt is on the list now too. Sorry about the previous deleted comments. First I had to re-post my comment because it posted under "unknown" rather than my name. Then I realized I spelled Sonia's name wrong and had to post again. Then I realized I mis-typed something so I posted a fourth time. Thanks for the condolences, Karen. Good point about the "With" in the title of the product!